Gewurztraminer has probably the lowest success rate of any good wine grape in the world. When it's right, it's delicious and unique: aromatic, with rose petal notes and a lovely mouthfeel. But the batting average of Gewurz winemakers worldwide is lower than Brendan Ryan's. The biggest problems are sugar and acid. Gewurz is a cool-weather grape that ripens suddenly and can become bitter, flabby and too alcoholic if the grapes are left on the vine for just one hot day too many. Alsace probably makes the best Gewurztraminers in the world, and still they're risky to buy unless a sommelier vouches for them. It's an interesting contrast to Pinot Gris, a forgiving grape with a much higher batting average but lower slugging percentage. Pinot Gris is safer to order, but it's likely to deliver a single at best, whereas Gewurztraminer, after swinging and missing a dozen times, sometimes slugs one into Triples Alley. I was in Washington last weekend at the same time as John Mariani, a wine critic for Bloomberg News who tasted a dozen wines and declared that the whole state's wines pack a "high alcohol wallup, little else." I don't write many blog posts about a single wine I like. 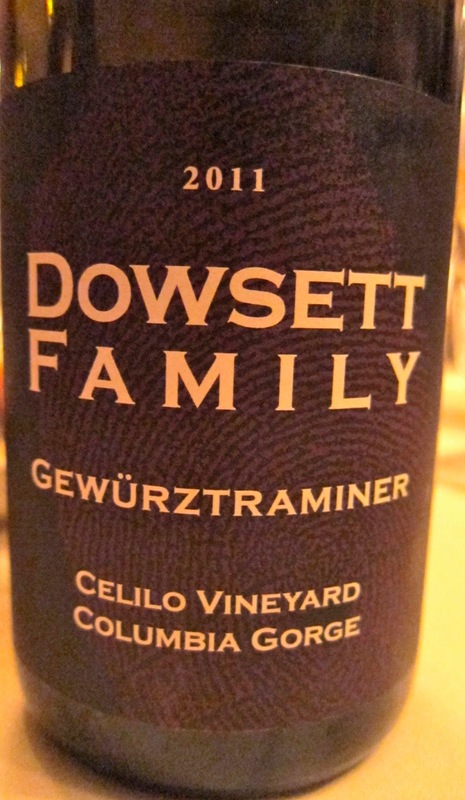 But what the heck: considering how little Gewurz is made in Washington, the Gewurz I loved -- Dowsett Family Celilo Vineyard Columbia Gorge Gewurztraminer 2011 ($22) -- gives me a much greater ratio of wines tasted/all wines made than Mariani, and he writes for Bloomberg! And unlike Mariani I actually interviewed the winemaker, so what the heck. I discovered how good the wine was in the best way possible: my glass of it kept emptying. That's my highest possible rating, higher than 100 points: I drank the heck out of it. There was a dinner, there were dozens of bottles on the table. Somebody told me to try the Dowsett Gewurz. I was skeptical, because I always am (and not just with Gewurz), but it was good. I had been into the red wine for a while, especially some excellent Yakima Valley Syrah, but this was refreshing and pretty -- rose petals, lychee, delightful mouthfeel. And -- I know this will be news to Bloomberg -- it was 12.7% alcohol. But I didn't know that. I didn't know that when I drank three glasses of it, after I'd already had lots of wine. 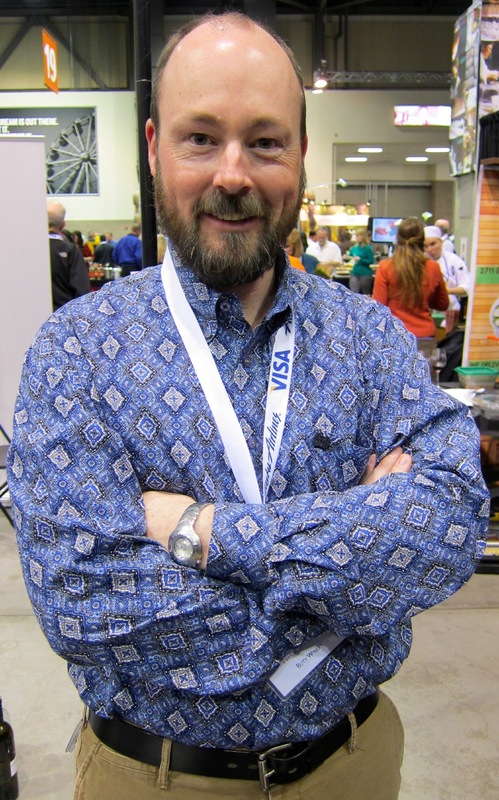 I didn't know that when I interviewed winemaker Christopher Dowsett. I didn't even know that when I started writing this blog post. I only learned it because Dowsett answered his cell phone Tuesday night. I loved the wine, not the numbers. Last week, I interviewed Dowsett at the Buty table at Taste Washington. Dowsett is also winemaker at Buty, which makes excellent blends including an ageworthy Semillon, Sauvignon and Muscadelle blend that is annually one of my favorite Washington whites and a nice Merlot/Cabernet Franc blend as well. In California, I have wandered over to event tables to talk to the assistant winemaker about his personal project and had the winery owner make a fuss, but Nina Buty Foster didn't complain when I didn't even taste her wine this time. Good karma for you, Nina. Dowsett said, "I wanted to make a dry Gewurztraminer. I worked with it in Oregon and I worked around the world, and I always loved Gewurztraminer." But his eyes are open: "It's a tricky grape. That's why people make it so sweet. It ripens so fast. It's easy for all your acid to go out." Dowsett, 44, fell in love with Gewurz AND got into the wine business thanks to -- of all people -- Ernest and Julio Gallo. "My parents were great drinkers of jug wine," Dowsett says. "They had a limited release magnum of Gewurz from Ernest and Julio Gallo. I don't know how many cases they made; this would have been 1980 or '81. They loved it. They found a piece of property in Willamette Valley that had old Gewurz vines." And that's where Dowsett grew up. He went to Oregon State, then worked at Rosemount in Australia for a couple years. He worked in vineyards for Robert Mondavi Winery and in the cellar at Schramsberg before moving to eastern Washington. He found the Gewurz vines he sought in the Columbia Gorge, one of the most interesting regions in Washington. The Celilo Vineyard was planted in the late '70s, and also has Chardonnay and Pinot Noir. "With the Columbia River right there, the river turns a little bit, and you get some of the cool influence from the river," Dowsett says. As for the 2011 wine, he says "2011 was a cool year. (The Gewurz) came in Oct. 26. That's Celilo. If you go out in September it'll make you nervous. It's really cool. The clusters in '11 were some of the most beautiful I've seen." Dowsett made 200 cases of the 2011 Gewurztraminer, 2/3 of his total production for his own label. (Buty isn't exactly enormous at 3000 cases a year.) The wines are distributed in Oregon, Washington, Idaho and -- don't ask me why -- Boston. Dowsett claims on his website he can help you find it. So to recap, I had 1 Gewurztraminer in Washington, and it was great. Therefore, Washington makes great Gewurztraminer. Good enough for Bloomberg, good enough for me. My wife loves Gewurz and good domestic ones are so hard to find. The problem with the Alsatian versions nowadays is that you don't know what you're getting - sweet or dry. There doesn't seem to be house styles anymore but rather vintage variation as the determining factor. I've been slowly trying more of the northern Italian versions and liking them. Bunnell Family Cellars (also of Washington) makes a delectable dry Gewurztraimer, I highly recommend it. The biggest problem is the name. Most Americans cannot even get to "Gewurz"
so give 'em a glass of something they can pronounce-Chardonnay. For my money, I'll have a glass of WA State Gewürztraminer. 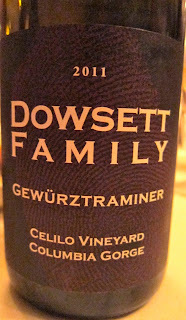 I've been enjoying the Dowsett Gewurz for several years, and I believed it to be the finest in the US. However, it now has a serious competitor - the Analemma Gewurz, also sourced from a high elevation site on the WA side of the Columbia Gorge. I'm not sure which I like better - they're both fabulous.